Beatriz Cortez is a visual artist and cultural critic based in Los Angeles, whose works often link contemporary philosophy to her own migratory experiences. In her solo exhibition, Nomad World, the artist conceptualizes the gallery space as an arcade, a space where games and amusement intersect with questions of global capitalism. 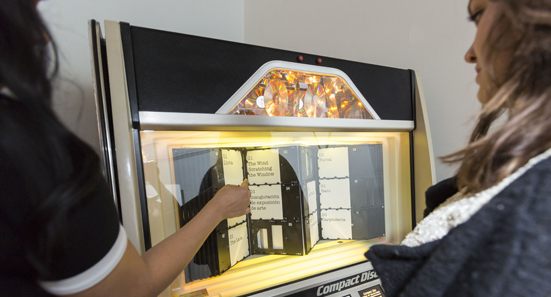 This body of work includes interactive sculptures and installations – a fortune telling machine, a pinball machine, a jukebox, and a photo booth – that invite visitors to move between childhood and the present, to envision being in new places, and to imagine being other. 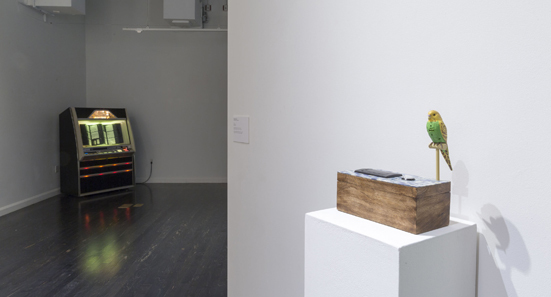 Through repurposed and hybridized machines that forge disparate levels of technology, the artist bridges diverse forms and experiences of modernity across time and place. The Fortune Teller, Migrant Edition, (2015) mimics the trained birds that pick one’s fortune printed on a card, a game seen throughout Latin America. 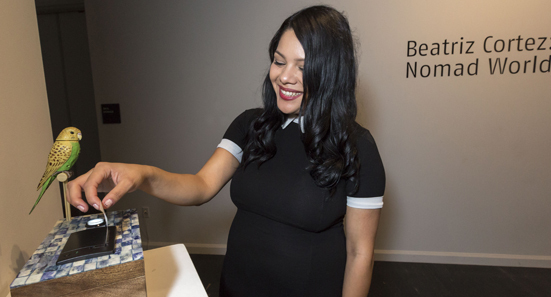 Cortez’s version uses an automated cashier’s paper tape to print the hopes for the future of people who have crossed borders, collected through interviews by the artist. Other works cull vintage machines that the artist intervenes and re-crafts as a means of locating split temporalities. 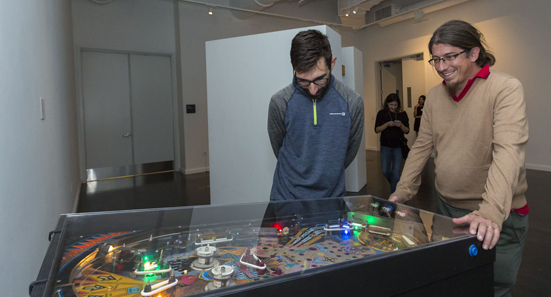 The Beast (2015), derived from a modified late 1970s pinball machine, allows the viewer to consider the pinball as if it were a traveler migrating to el norte, whose fate is controlled from a removed positionality and by stokes of good or bad luck. The Jukebox (2015) plays audio recordings of urban landscapes, atmospheric sounds that often form the texture of memory. 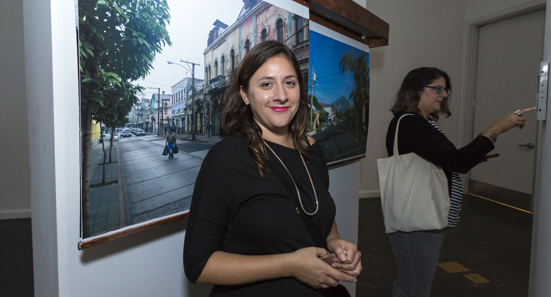 Simultaneity is a recurrent theme in the artist’s work and in Photobooth (2015), the public can choose different backdrops from sites in Central America to pose in front of and take selfies. 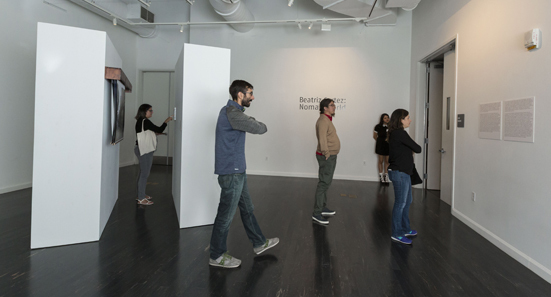 By uploading the photos to social media, viewers participate in a disembodied, virtual, and transnational space. Collectively, the works in Nomad World reveal associations with dislocation and fragmentation, mirroring the artist’s experiences split between San Salvador and Los Angeles. Beatriz Cortez was born in El Salvador and migrated to the United States in 1989. She has shown her work nationally in Los Angeles, San Francisco, Washington, D.C., and New York, and internationally in El Salvador, Guatemala, and Costa Rica. She holds a Masters in Fine Arts from the California Institute of the Arts and a doctorate in Latin American Literature from Arizona State University. She teaches in the Department of Central American Studies at California State University, Northridge.